There is no place on Earth as cherished, as holy, to as many people as the Kaaaa, home of God, located in the city of Mecca with a population of 3 million people. During Hajj, the city’s population almost doubles. I arrived in Mecca four days ago to perform Umrah, a pilgrimage. I must admit, going into the pilgrimage I did not have a specific spiritual agenda but one thing I was most excited about was seeing the Kaaba. I grew up with the image of this holy site on people walls, coffee tables and even computer screens. I always wondered what it would be like to stand in front of it, touch it and circle it like millions of Muslims do every year. Once we arrived in Mecca and checked into our hotel, we wasted no time to make our way to Kaaba, which is located directly in front of our hotel. With my eyes closed, I was guided by experienced pilgrims through the hallways of Masjid Al Haram, the mosque surrounding Kaaba. My heart was beating fast and my legs were weak from excitement. I was encouraged to think of the biggest wish of my life and ask for it at the first sight of the Kaaba—purportedly all wishes at that moment are granted. I was wracking my brain thinking of the worthiest wish, as the pressure was mounting for the first sighting of the holy Kaaba. After many twists, turns and toe stubs on the rough walkway, we stopped, I opened my eyes—there it was the Kaaba, of my dream, right in front of me but much smaller than I had imagined. I felt a great disappointment as I stared at the Kaaba without feeling a spiritual connection or a stir of happiness in my heart. The other women in my group were hugging, holding each other and wailing—while I stood there feeling like an underwhelmed child on Christmas day. I questioned my intention for this pilgrimage, my spirituality and my ability to be moved. After some introspection I blamed my lack of connection on the crowds, our seven hours of travel to get there and perhaps my own unwarranted expectations of certain type of reaction. The next day I decided to go in by myself. To experience it my own way. After fighting through the crowds and losing my way to ground level access, I accidently ended up on the upper level of the two platforms overlooking the Kaaba. I elbowed my way to a spot where I could have full view and looked down at the thousands of people circling the Kaaba in a hypnotic rhythm. As I stood there quietly—not reading the Quran as suggested, or praying for riches or eternal good health—my mind emptied of all thought and tears streamed down my cheeks. Just like that, I felt an overwhelming energy rising from below as thousands of hopeful pilgrims prayed, chanted and circled the Kaaba. The tears were unstoppable. Luckily a lovely young lady my dress sleeve by handing me sheet after sheet of tissues to dry my tears. Sometimes we find a connection when we least expect it. The Kaaba has a history pre-dating Islam. Muslims believe there are two Kaabas—one on earth and the other directly above it in heaven. 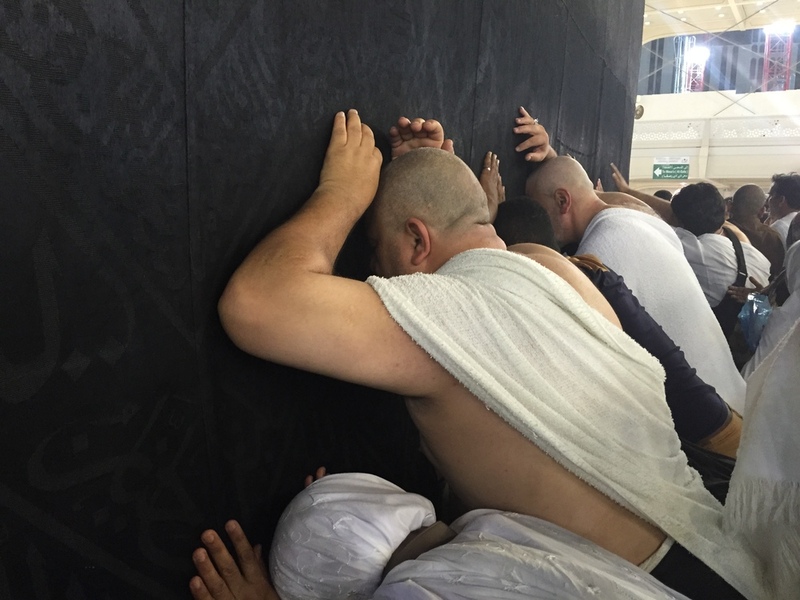 Muslims around the world, wherever they are, face the Kaaba five times a day for prayer. Much to my surprise, the Kaaba is shrouded in a thick smooth fabric, almost rubber like, not velvet as I had assumed all these years. Kiswah, the official name of the black covering is made of 1477 pounds of silk which goes through chemical processing to strengthen it against the wear and tear it faces when pilgrims touch, rub and even drape themselves against the Kaaba. Various Suras of the Quran are hand stitched with 33 pounds of gold thread by master craftsmen. The kiwah is changed once a year on the 10th day of Hajj. The old kiswah is removed, cut into pieces and given to certain individuals, dignitaries visiting Saudi Arabia or various organizations. The color of kiswa has changed over the years but since 1207 the black has been permanently adopted. Currently the mosque, Masjid Al Haram, surrounding the Kaaba, is going through a multi-billion dollar expansion, which will allow over two million pilgrims to visit the Kaaba during Hajj. Until then, the pilgrims have to fight through a maze of construction to reach the Kaaba.